Belgian businessman and artist Freddy Monnickendam had tried unsuccessfully to acquire the rights to Peyo’s The Smurfs since 1977. Monnickendam became the head of SEPP International S.A., the branch of publisher Dupuis responsible for the merchandising of The Smurfs’ comic. He brokered the deal between Peyo, NBC and Hanna-Barbera to adapt the comic into an animated series. However, Monnickendam’s relationship with Peyo quickly soured when the men disagreed over the direction the series should take; Peyo wanted it to remain faithful to the comics, while Monnickendam wanted it to become mainstream and accessible. After a legal dispute over the division of the rights and money for the show, Monnickendam decided to try and find a property to acquire to compete with The Smurfs. 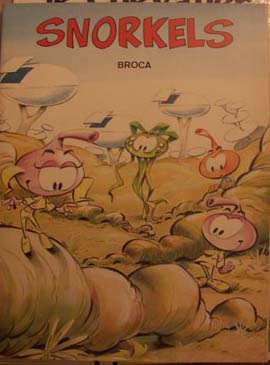 Monnickendam came upon Nic Broca’s self-published Snorkels; the evolution of an idea that began as the “Diskies” in the comic series Spirou et Fantasio. Monnickendam acquired the rights to the characters from Broca and the two of them entered into a partnership with Hanna-Barbera to turn it into an animated series. 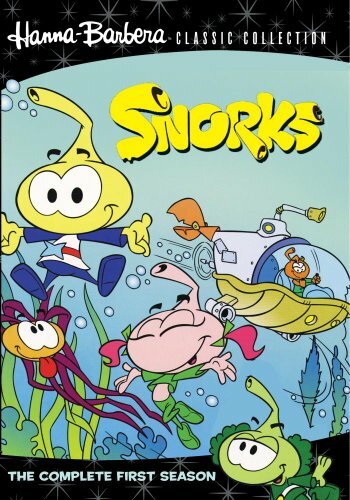 Snorks (or Snorky), as they were renamed, was essentially the underwater version of The Smurfs. They were a race of colorful creatures that lived under the sea and had large snorkels, also called snorks, coming out of the tops of their heads. They could use these snorkels to propel themselves or objects through the water, breathe, or make a variety of sound effects. 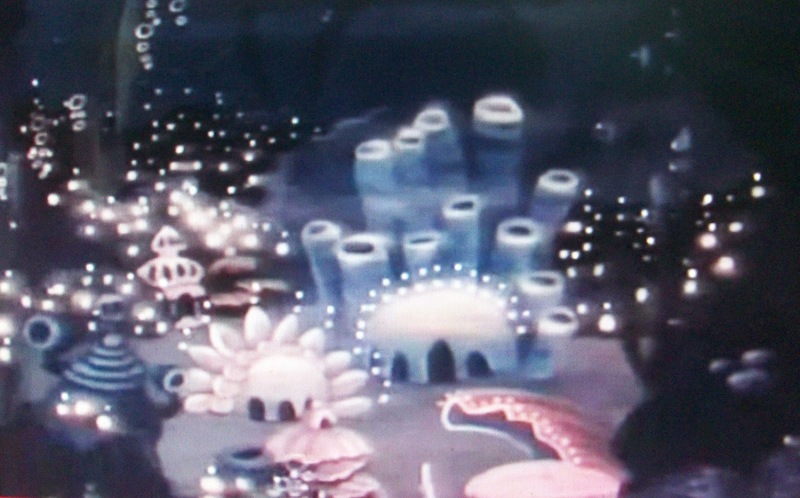 Unlike The Smurfs’ medieval setting, Snorks was set in modern times with underwater equivalents to modern conveniences like television and automobiles. They lived in a capitalist society, using money called “clams” that were shaped like clamshells to purchase things. They also primarily ate things made out of kelp, including ice cream and burgers. Snorks focused primarily on a group of teenaged friends from the town of Snorkland. Allstar Seaworthy (Michael Bell) was the defacto leader of the group. He was brave, smart, athletic and generous. Casey Kelp (B.J. Ward) was a tomboy and Allstar’s love interest. She was equally athletic, brave and intelligent, and would always come to the defense of anyone that needed it. 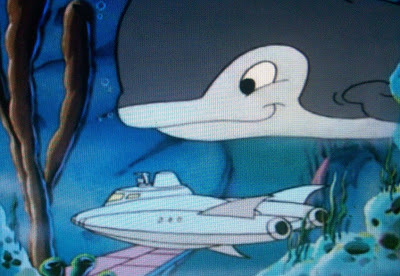 Tooter Shelby (Frank Welker), was Allstar’s best friend and had a condition that prevented him from talking, however he communicated by making sounds with his snork. Daffney Gillfin (Nancy Cartwright) was good-hearted, although vain and always concerned with her looks. Dimitris “Dimmy” Finister (Brian Cummings) was an aspiring comedian and fighter, however, his attempts to do either usually led to unfavorably comedic results. He and Daffney frequently dated. Wellington Wetworth, Jr., also known as simply “Junior” (Barry Gordon), was the spoiled rich son of the Governor, Wellington, Sr. (Frank Nelson). He was the series’ original “villain,” constantly seeking fame and fortune at the expense of others. He often involved his little brother, Willie (Fredricka Weber), in his schemes and treated him shabbily as thanks; however, Willie was Junior’s polar opposite and generally more well-liked. Other characters included the aforementioned Governor. He was vain and egocentric, and acted like a stereotypical dishonest politician. The Governor’s actions, while predominantly left unchecked until a situation causes him to lose face, did sometimes come under question by the true power of Snorkland: the shadowy Council of Elders (Peter Cullen and Bell). Dr. Galeo Seaworthy (Clive Revill) was Allstar’s scientist uncle who often provided Allstar and his friends the tools needed on their adventures, including their submarine, The Silverfish. Occy (Welker) was Allstar’s pet octopus who could handle several instruments at once. Jo-Jo (Roger DeWitt) was a wild Snork with two snorks on his head, and was essentially Snorkland’s version of Tarzan. His companion was Fengy, a dogfish. The Snork-Eaters were large creatures who hunted and ate Snorks, and were a constant environmental threat to them. The Silverfish and a whale. Hanna-Barbera, along with SEPP International S.A. and 3M France produced a 3-minute pilot episode to sell the show to NBC. 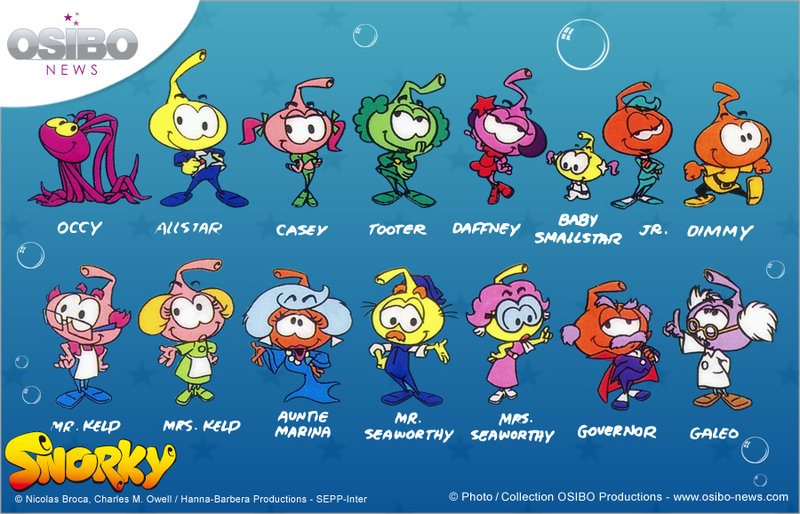 NBC bought the series, and Snorks made their debut on September 15, 1984. The intro to the series was done in the form of narration from the log of a sea captain who encountered the Snorks after his ship sank in the 1600s. Among the show’s writers were Gordon Bressack, John Semper, Jr., Alan Burnett, Tom Ruegger, Lane Raichert, Glenn Leopold, and Charles M. Howell, IV. 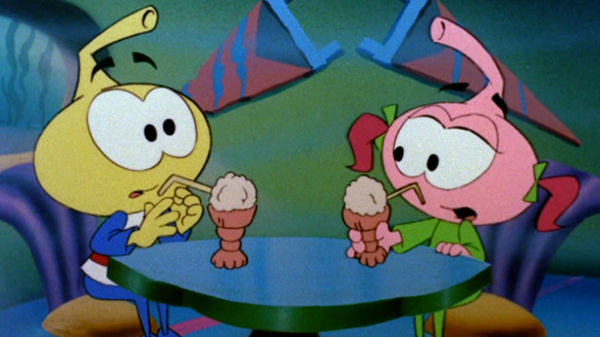 NBC renewed the show for a second season, and Snorks was included in their Saturday morning preview special Back to Next Saturday. Bell reprised his role as a limitedly animated Allstar interacting with the stars of the special, leading to clips from the show. The season premiered the next day on September 14, 1985 with a new theme: “We’re the Snorks.” Both intro themes were composed by Hoyt Curtin, who also scored the show. Along with the theme, the second season brought about several changes. Allstar’s voice was performed with a lower pitch while Casey’s was performed higher. A new recurring villain was introduced: Dr. Strangesnork (Rene Auberjonis). He was an absent-minded mad scientist brother of Galeo who sought to conquer Snorkland with his various schemes and inventions. He was accompanied by Finneus (Welker), a catfish who kept reminding Strangesnork of everything he’d forget. The third season was delayed until 1987 and aired on both NBC and in first-run syndication. 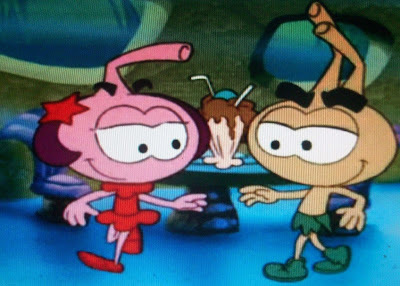 The show gained its third and final theme, “Come Along With the Snorks” composed by Chase/Rucker Productions. That theme is the most well-known of the series, having replaced the two previous ones in later syndicated reruns. Raichert took over as head writer, leading to a more adventure-oriented direction for the show. This was the first and only season to feature digital ink animation, giving it a different look when compared to the previous two. Dimmy largely disappeared from the show outside of several cameo appearances. 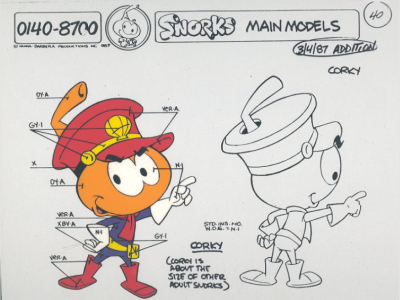 In his place, Jo-Jo was upgraded to a series regular, as was Corky (Rob Paulsen); a dedicated officer of Snorkland’s police force, the Snork Patrol. Gordon took over voicing the Governor after Nelson had died, as did Jim Cummings in the role of Allstar’s father after his actor, Bob Holt, also passed on. Junior’s role as a villain was greatly reduced and he became more of a pseudo-friend to the main group. In his place were the new villains Bigweed (Bell) and Li’l Seaweed (Ward), seaweed-like creatures with magical abilities that wanted to conquer Snorkland and enslave the Snorks, and the Great Snork Nork (Welker), a vampire Snork whose snork was on the front of his face and could fire electrical bolts from his hands. Snip and Snap, two robot Snorks created by Bigweed, turned on him and became residents of Snorkland. Allstar and Casey sharing kelp shakes. Snorks was renewed for a fourth season, but it was aired on two different networks concurrently. USA Network took over the Saturday airings beginning on September 10, 1988, while ABC aired it in daily syndication beginning on October 24. Up until this season, every episode was comprised of two segments. After the season’s seventh episode, the show switched to a single-story format for the remainder of its run. While the animation reverted back to the older style from the previous season, a new style was used for the characters and the overall animation was lighter when compared to the rest of the series. Although Snorks was a success in its own right, it didn’t quite match the success of The Smurfs. Monnickendam’s partnership with Broca came to an end and eventually SEPP disbanded as well. Snorks remained on the air in reruns until May of 1989. During its original run, a wide array of merchandise was released. Happy House published a series of educational/coloring books, while Random House did a series of books continuing the Snorks’ adventures. International Games released a board and card game featuring the characters. Applause released a series of erasers in the shape of the characters’ heads and plush dolls that came in three sizes. They also released a series of PVC figurines, along with Yolanda and Miniland. Tomy produced two types of wind-up toys that either swam or walked, and a cartoon maker that allowed kids to draw their own Snorks by rubbing crayons over plates. Power-Tronic made a radio in the shape of Allstar’s head, a design which was also utilized for a squirt gun with his Snork being the barrel. Thermos released a lunch box, and Worldvision Home Video a promotional mug to celebrate their home video deal. Other products included bed sheets, a block cube puzzle, a 3-D puzzle, stamps, a variety of stickers, squeak toys for dogs, a metallic bank and crank toy, a crib mobile and t-shirts. 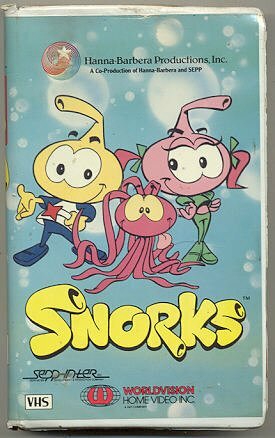 Snorks returned to USA for syndicated reruns between 1990-92, where it also ran on Cartoon Network and TBS concurrently. Reruns also ran on Cartoon Network’s sister channel, Boomerang. Many of these reruns combined segments from the various seasons together rather than presenting them in their original broadcast form. Between 1985 and 1990, several VHS collections of various episodes were released at first by Worldvision, and then by its successor Hanna-Barbera Home Video. In 2012, Warner Archive released the complete first season to DVD as part of their Hanna-Barbera Classics Collection, and Hulu was allowed to release 39 episodes as part of an agreement with Content Media Corporation. The first season DVD presented the original NBC opening sequence for the first time since the episodes’ initial broadcast; however, several of the episodes’ title cards ended up lost and the episodes aren’t in broadcast order.. It wouldn’t be until 2015 that they would release the second season, which also maintained its original theme. The third and fourth seasons were packaged together and released the following year. “Journey to the Source / Vandal Scandal” (9/15/84) – The Snorks travel to the source of their steam when no steam rises for their Steam festival. / A graffiti artist is loose in Snorkland and everyone is a suspect. “Hooked on a Feeling / The New Neighbors” (9/22/84) – A dejected Occy falls in love with a fisherman’s lure. / A plague of Hummerfish threaten to eat all the Snorks’ kelp. “Das Boot / Which Snork Snitched?” (9/29/84) – Snorkland is in mass confusion when a boot falls from a ship below. / After Allstar rats out Junior for cheating, Junior gets a myna birdfish to spy on everyone. “Allstar’s Allstar Band / Snorkymania” (10/6/84) – Allstar holds fundraising concert for his uncle Gallio, but Junior is determined to ruin it. / When toxic drums are dumped and break open near Snorkland, the chemical inside causes everyone to laugh uncontrollably. “A Snorking We Will Go / Now You Seahorse, Now You Don’t” (10/13/84) – The Snorks go on a camping trip and are scared by a campfire tale. / Allstar pits his seahorse Seabiscuit against Junior’s. “Snorkdance / Snork Marks the Spot” (10/20/84) – Tooter fills in for Allstar at the dance after he sprains his foot, but he turns out to be Junior in disguise. / Occy finds a treasure map and Junior steals it, replacing it with a fake. “Junior’s Secret / The Big Scoop” (10/27/84) – Junior panics when his favorite toy is accidentally donated to Toys for Snorks. / Junior has Willie make his fake newspaper story come true. “The Blue Coral Necklace / Up, Up & Awave” (11/3/84) – Allstar “borrows” his mother’s necklace and it ends up destroyed by Occy. / The 10th Annual Snorkland Balloon Race is heard by oceanographers from above. “Snorkin’ Surf Party / The Snorkness Monster” (11/10/84) – At the beach, Junior brags that he’s a better surfer than Allstar. / Angus McSquid warns the Snorks about the Snorkness Monster in the caves of the Snorkness highland. “A Snork on the Wild Side / Allstar’s Double Trouble” (11/17/84) – The Snorks meet the wild Snork Jo-Jo. / Allstar needs to figure out how to juggle two dates on the same night. “Fine Fettered Friends / Time Out for Sissies” (11/24/84) – Allstar and Junior end up trapped together in ancient handcuffs. / When Dimmy takes ballet to improve his football game, a group of bullies pick on him. “Me Jo-Jo, You Daffney / The Old Shell Game” (12/1/84) – An accident brings Jo-Jo and Daffney together, and Jo-Jo tries to woo Daffney. / Allstar and Dimmy are asked to housesit for a teacher, and Junior decides to play a major prank on them to get them in trouble. “The King of Kelp / Whales Tales” (12/8/84) – Junior tries to win the kelp harvest competition by sabotaging Allstar’s machine. / The Snorks try to free a baby whale from a fish net. “Snorkitis is Nothing to Sneeze At / The Whole Toot and Nothing But…” (9/14/85) – Galeo tries to come up with a cure for a sneezing epidemic that’s hit Snorkland. / Tooter is in danger of being left back because his method of talking causes him to fail speech class. “Chickens of the Sea / Never Cry Wolf-Fish” (9/21/85) – The Snorks suffer a salt shortage. / Dimmy’s overactive imagination causes Allstar and Casey to ignore him when he really needs help. “A Hard Day’s Snork / Learn to Love Your Snork” (9/28//85) – A piperfish uses hypnotic music to lure Snorks into its mouth. / Casey becomes self-conscious after Daffney makes an abstract sculpture of her. “Allstar’s Freshwater Adventure / Dr. Strangesnork” (10/5/85) – Allstar befriends a freshwater Snork that gets washed into Snorkland. / Dr. Strangesnork plans to take over Snorkland with a mind-swapping device. “It’s Just a Matter of Slime / Water Friends For?” (10/12/85) – The kelp helpers are tired of being taken for granted and leave Snorkland. / Casey and Daffney have tickets to different events and decide to go their own ways, leading to Daffney ending up in danger. “Junior’s Octopuppy / The Shape of Snorks to Come” (10/19/85) – Allstar recounts how Occy went from being Junior’s to his. / A seaquake sends Junior to the future. “Casey and the Doubleheader / The Ugly Yuckfish” (10/26/85) – Casey and Dimmy meet a two-headed sea creature. / A Yuckfish from the Wild Fish Reserve falls in love with Daffney. “Gills Just Want to Have Fun / Guess What’s Coming to Dinner!” (11/2/85) – Dr. Strangesnork plans to flatten Snorkland with his wave machine. / The Snorks try to help a vegetarian Snorkeater with his parents, and Junior spreads a rumor Jo-Jo is in league with them. “A Sign of the Tides / The Littlest Mermaid” (11/9/85) – King Neptune loses his tide-controlling horn and everything starts uncontrollably floating. / Dimmy meets a real mermaid and Dr. Strangesnork has plans for her. “I Squid You Not / The Backwards Snork” (11/16/85) – Occy runs away after he and Allstar fight, and he’s captured by Slugwart. / The Snorks meet a strange Snork that does everything in reverse. “All’s Whale That Ends Whale / Allstar’s Last Hour” (9/12/87) – Escaping an angler fish leads the Snorks to accidentally swim into a whale’s mouth. / The Snorks have to find the reclusive King Crab in order to find a cure for Allstar’s ailment. “A Willie Scary Shalloween / Sea Shore Sideshow” (9/19/87) – Willie runs away to the Lost Valley after being uninvited to a party. / Allstar, Casey and Tooter are captured by an evil sideshow owner and are made to perform tricks. “Freeze Save Our Town / Snip & Snap” (9/26/87) – Corky and the Snorks head north to rescue a village from Snorkeaters. / Bigweed creates two robots to win over and distract the Snorks while he conquered Snorkland. “Junior’s Empire / The Golden Dolphin” (10/3/87) – Junior uses the strategies of Julius Seastar when he runs for class president against Casey. / The Snorks rescue a golden dolphin captured by Silas Livebait. “It’s Always Darkest Before the Snork / The Sand Witch” (10/10/87) – The giant Snork Nork decides to take away the Snorks’ daylight until he gets what he wants. / The Sand Witch terrorizes Snorkland, and Corky ends up sucked into her portal when Bigweed interferes. “Tooter Loves Tadah / The Shady Shadow” (10/17/87) – Tooter meets a girl who toots like he does, but he can’t seem to get her to notice him. / Dr. Strangesnork’s machine separates Willie from his shadow, and his shadow gets Willie in trouble for pranks around town. “Daffney’s Ransom / Salmon Chanted Evening” (10/24/87) – Bigweed kidnaps Daffney in order to get a rare plant the Snorks found. / On a treasure hunt Junior, Casey and Daffney end up helping a puny salmon get upstream and out of trouble. “Casey in Sandland / Reefberry Madness” (10/31/87) – Casey switches places with a look-alike princess to experience each other’s lives. / Bigweed and Lil Seaweed sneak into town and sprinkle magic powder on reefberries, causing the town to become silly gluttons. “A Farewell of Arms / Mummy Snorkest” (11/7/87) – Occy becomes jealous of a new octopus in town. / The Snorks go on a trip to retrieve the mummy of King Tutsnork, but the Great Snork Nork has his own ideas. “Jo-Jo in Control / The Day the Ocean Stood Still” (11/14/87) – The Snorks try to include Jo-Jo in more things, but he may unwittingly destroy the town with his helpfulness. / Aliens visit Snorkland, however something seems off about them. “Chills, Drills and Spills / The Longest Shortcut” (11/21/87) – An oil drill trashes the Snork Pole, and the Snorks take to the rig to try and stop it. / The Snorks end up in a forest and cave where everything wants to chase them. “Willie and Smallstar’s Big Adventure / Taming of the Snork” (11/28/87) – Willie and Smallstar get left out of a camping trip and go on one of their own. / Junior tries to help a sultan’s daughter stop being mean by out-meaning her, which causes her to run away and end up kidnapped. “Daffney’s Not So Great Escape / Willie’s Best Fiend” (9/10/88) – Daffney gets her friends captured by an ogre family. / Willie befriends a little Snorkeater. “Day of the Juniors / Dr. Strangesnork’s Bomb” (9/17/88) – Junior decides to clone himself with disastrous results. / Jealous of his brother, Dr. Strangesnork decides to hide a skunkfish bomb in Snorkland. “A Starfish is Born / Ooze Got the Snorks” (9/24/88) – The Snorks try to get a star back up to the sky. / Bigweed unleashes an ooze monster on Snorkland. “The Silly Snorkasaurus / Who’s Who?” (10/1/88) – The Snorks make a game out of finding a shell for Galeo’s machine, and end up finding a Snorkasaurus egg instead. / Galeo’s machine causes Allstar and a Snorkeater to accidentally switch bodies. “Battle of the Gadgets / Little Lord Occy” (10/8/88) – Li’l Seaweed acquires Junior’s invention and the Weeds use it to conquer Snorkland. / A rich Snork believes Occy is one of his long-lost pets, and Junior convinces Allstar to try and trick Occy into leaving him. “Junior’s Fuelish Kelp Rush / The Boo Lagoon” (10/15/88) – When Junior finds some red kelp that acts as a super fuel, he sees a way to make a quick buck. / Smallstar accidentally takes off in Corky’s sub and ends up in the Boo Lagoon. “How the Snork Was Won / In Junior’s Image” (10/22/88) – The Governor and Chief Featherfin relay the story of the founding of Snorkland. / Junior uses Galeo’s invention to bring his reflection to life and becomes jealous when the Snorks prefer it to him. “Robosnork” (10/29/88) – Galeo’s robot helps Corky with his job a little too well and Corky leaves just as the robot short circuits and begins putting everyone in jail. “Summer & Snork” (10/29/88) – Junior tries to frighten Allstar out of his role in the play while Bigweed and Li’l Seaweed attempt to kidnap its star, Tallulah Bankfish. “Allstar’s Odyssey” (11/5/88) – Galeo relays a story about ancient Grecian Snorks and their treasure, which sets Allstar and the Weeds after it. “In Greed We Trust” (11/5/88) – Junior and Bigweed work together to keep others away from the treasure at the end of the rainbow, only to discover it’s a trap and they’ve become the treasure. “Jaws Says the Word” (11/12/88) – Allstar gains a shark friend after helping him out, which Junior uses against him when he tries to prove how much braver than Allstar he is. “Prehisnorkic” (11/12/88) – Melting a threatening iceberg leads to the thawing out of a prehistoric Snork who causes trouble in the modern world. “Rhyme and Punishment” (11/19/88) – Junior and Daffney discover a secret room in the library where a magical princess in a book wants to trade places with Daffney to experience the world. “The Wizard of Ice” (11/19/88) – The Snorks try to help a fireball named Ember get back to her home after an Ice Wizard evicted her. “Big City Snorks” (11/26/88) – The Snorks help a human boy evade the unscrupulous men who seek to take his inheritance from him. “Nightmare on Snorkstreet” (11/26/88) – A mistaken magazine delivery leads the Snorks to encounter a monster in an old castle. “Robin Snork” (12/3/88) – Jo-Jo has been stealing stuff from a store in order to feed Snorks held captive by the Weeds who have taken over a town. “Snorkerella” (12/3/88) – Casey, Daffney, Li’l Seaweed, Allstar, Junior and Lester all compete for Homecoming Queen and King in order to get a date with a popular Snork. “Snork Ahoy” (12/10/88) – Casey and Allstar end up on a dangerous treasure hunt with The Governor’s pirate brother. “The Daring Young Snork on the Flying Trapeze” (12/10/88) – Daffney and Li’l Seaweed end up as trapeze artists together in the circus. “Oh Brother!” (12/17/88) – Strangesnork goes back in time to prove that Galeo always stole his inventions, and then decides to alter time in his favor. “The Story Circle” (12/17/88) – When the power goes out at the Wetworth house, Grandpa Wetworth initiates a game of Story Circle with the kids there. “I’ll Be Senior” (12/31/88) – Casey and Allstar try to help Grandpa Wetworth get over his feeling old while Bigweed and Li’l Seaweed make a bomb that will turn Snorks into babies. “The Day They Fixed Junior Wetworth” (12/31/88) – After Junior tries to sell toys at Casey’s birthday party, Allstar relays a tale of when Junior used to be nice and shy. “First Snork in Space” (1/7/89) – Casey helps an alien find ingredients she needs for a potion to help her father, and Li’l Seaweed invites herself along when she hears a reward being offered. “Wish or Wish Out” (1/7/89) – A salesnail comes into town and offers a pearl that grants one wish per owner, leaving Willie, Casey and Allstar to realize some wishes shouldn’t be granted. “All That Glitters is Not Goldfish” (1/14/89) – Casey and Jo-Jo convince Corky to take a vacation, only to end up needing to help an Egyptian Snork reclaim his kingdom. “My Dinner With Allstar” (1/14/89) – Allstar and Bigweed get into a fight over a magic lamp that might be more trouble than it’s worth.